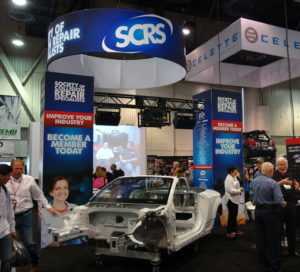 Experts from Audi, the Auto/Steel Partnership, FCA and Porsche will headline the first of the three OEM Collision Repair Technology Summits this year at SEMA, the Society of Collision Repair Specialists announced Monday. “The Rules – and Challenges – of Structural Repair on Modern Architecture” from 9-10:30 a.m. Nov. 1 will feature Dan Black, FCA advanced body development service engineer and collision repair manager; Robert Hiser, Auto/Steel Partnership advanced high-strength steel repairability lead and General Motors body structure service engineer; Shawn Hart, Audi curriculum designer and collision instructor; and Mike Kukavica, Porsche aftersales techical training collision repair technology instructor. “During the open and interactive session, panelists will explore how modern vehicle architecture and design specifically influence repair facility processes,” SCRS wrote in a news release. “From research of advanced substrates and mixed-material designs to joining processes and equipment necessities, the program will fully explore the range of considerations necessary to perform structural collision repair. SCRS plans to soon announce more details about the other two OEM Summit sessions mentioned in Monday’s release: “The Evolution of OEM Network and Expectations” from 11 a.m.-12:30 p.m. and “The Future Impact of Telematics, Technology, Transportation and the Collision Industry” from 3-5 p.m.
SCRS also on Monday acknowledged 2018 OEM Summit sponsors AkzoNobel, BASF, CCC, General Motors, PPG, Sherwin-Williams and Spanesi. Register for the structural course here, sign up for all three parts of the OEM Summit here, or, for the best deal, buy the Full-Series Pass for unlimited Repairer Driven Education access. Classes are $75 now, $85 after the Oct. 12 early bird deadline. The full-series pass, which costs $375 now and $400 after the deadline, grants the repairer access to every RDE class, all three sessions of the OEM Summit, the Sky Villa afterparty, and the brand new IDEAS Collide TED-style event Friday, Nov. 2.